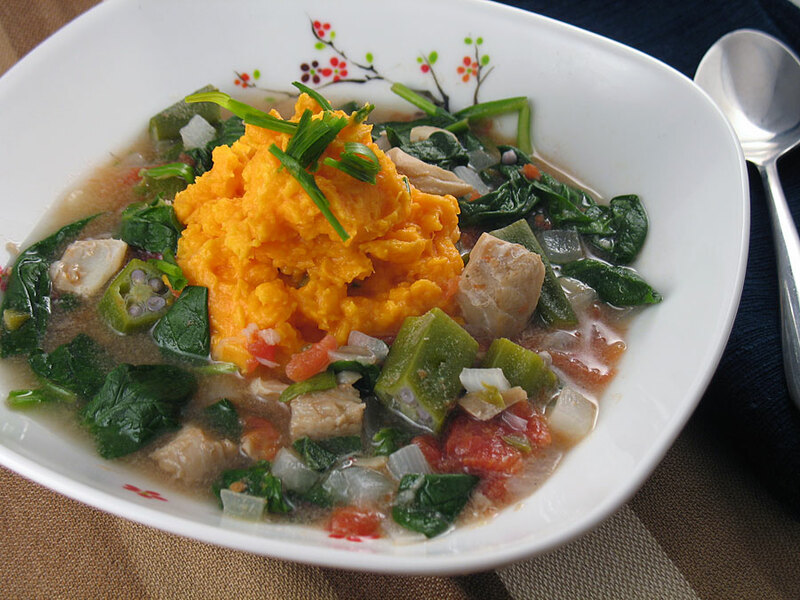 This awesome soup comes from The Ultimate Soup Bible: salt cod, spinach, and okra in a tomato-wine broth surround a mountain of mashed yams. Very different, and very delicious! This is so good! I like the cod, though it’s not as salty as I’d expected. Soaking for over a day will do that, I guess. Never in a million years would I have thought to put mashed yams in the middle of a soup! Mashed Yams? More like Mashed YUMS! I know! We should make the yams on their own, too — so good. You may not realize that the people out there can’t see you touching your fingers together to indicate that “this big” means “miniscule”. Um, it’s kind of implied if I refer to it as a “mountain” of potatoes. Drain and skin the salt cod, then rinse under cold water. Cut into bite-sized pieces and set aside. Heat the oil in a large, heavy pan. Add the garlic, onion, and jalapeño and cook for 4-5 minutes over medium-high heat until softened. Add the salt cod and cook for another 4 minutes until it begins to color. Stir in the tomatoes, wine, and bay leaves and bring to a boil. Add the water, return to a boil, reduce the heat, and simmer for 10 minutes. Add the okra the soup and cook an additional 10 minutes. Stir in the spinach and cook for 5 minutes until the okra is tender. While the soup is cooking, prepare the yams. Peel the yams and cut into large dice, then place in a pan with the lemon juice and add cold water to cover. Bring to a boil and cook for 15-20 minutes, until tender. Drain well, then return to the pan to dry over the heat for a few minutes. Add the butter and cream, and mash the potatoes. Season as desired. Add the chives. Season the soup with salt and pepper. Spoon portions of the yams into the center of six bowls and ladle the soup around it. Serve and enjoy!